Beetles fight a war against frogs and pine cones (!) in this child’s allegory of World War One by Ladislaw Starevich. Here, he gives us a live-action wraparound story in which a small child finds a crushed lily in a field and asks her grandfather what has happened. The granddad sees an opportunity for childish attentions and weaves the tale of how the beetles decided to wage war on their neighbors, chopping down the lily along the way to serve as a bridge for their mechanized forces. 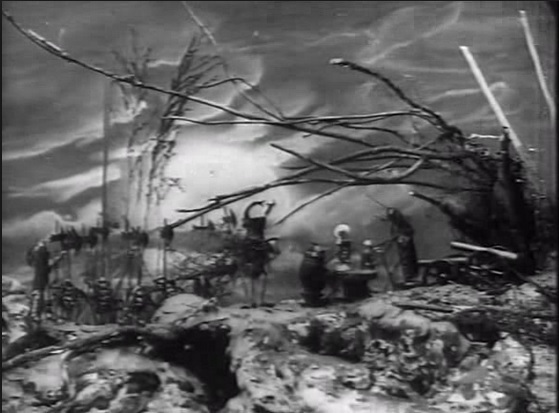 The story of the lily and the war are accomplished through more of Starevich’s deft animations of small dead animals. I found the propagandistic side of the movie a bit disappointing from someone capable of so much more creative storytelling, but the animation made up for it. As usual, the bad guys are generally more interesting than the good, with their miniature cars, beer steins, and cannon, although the scenes of pine cone jubilation after the armistice were entertaining as well. There’s not much information on this movie, even the year is uncertain on the DVD liner, and I’m not certain who the mysterious “Skobelev Committee” was who ostensibly funded it.